In the all-out battle against Desoloth the Final, heroes chose to fight for Good or Evil... or betrayed their compatriots and joined sides WITH Desoloth! In AQW's first 3-way war, Evil has prevailed! * The overwhelmingly Evil nature of so many of Lore's champions has determined Desoloth's fate. Now it's up to YOU to see it through to the final death! Not only a dragon dies this day. After your battle, Desoloth will be nothing more than a pile of bones resting inside the Cor Draconis. At least, as far as YOU know! 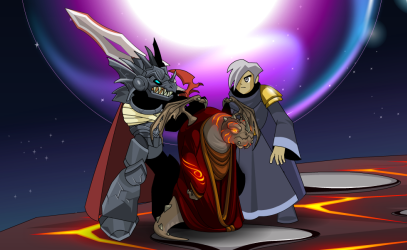 But things aren't always what they seem on Lore, and Desoloth's final battle may NOT be his last! * And we were so SURE that Desoloth's side would win! Yorumi made some awesome changes to the game's engine for this boss battle! We won't go into the dry coding details, but know that in this battle, the Primes will be with you and they will aid you in your fight! The Fire Prime's aid will increase your damage! As you reduce Desoloth's health, each Prime will aid you in some way. We've never before been able to have art directly affect your character's stats before, so this is a really fun change that we can use again in the future! Your choices WILL matter! In the pre-boss battle, you'll be able to choose between Good, Evil or Desoloth. That will set the tone for your boss battle. AFTER the battle, you'll be able to choose again. Choose carefully, because how you answer Hs'Sakar's last question will change the way the Etherstorm NPCs view you after you've completed their storyline! There's a LOT of corpse to loot after this boss battle. (A big boss means big loot!) Desoloth has a chance to drop the member-only Elemental Dissonance armor and helm (goes great with the Horned Crown of Dissonance in the Rares shop!) as well Desoloth's Bane, a wicked weapon forged by Dage the Evil! Will YOU adopt one Omom's babies? 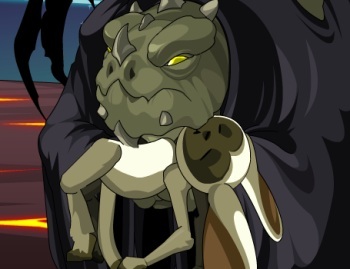 And don't forget to look for an Omom's Babies pet while looting the boss! (Omom's Youngest, the cape, can be found in the War Rares shop! **) You won't want to abandon them after seeing the cutscene! Non-members can look forward to the cunningly crafted Crimson Dragoon armor and helm! Which do YOU prefer: Dragoon or Dragon? MAN you guys finished this war FAST! We couldn't believe it was over on Sunday. We had all three endings planned out, but didn't want to animate one until we saw which side was going to win. And when it became clear that EVIL was going to be the winner, we had to create a MAJOR new piece of art! 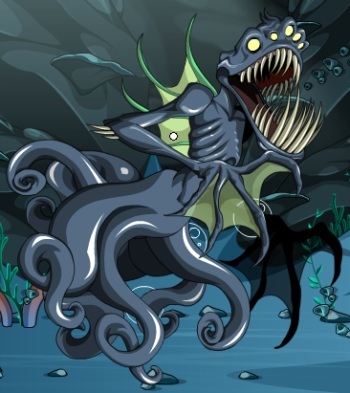 J6 really rocked it out; you'll know it when you see it, and THIS creature will appear in the final battle against Chaos! NOTE: More design notes will be coming in a bit. Right now, we want to release the boss fight and cutscenes! 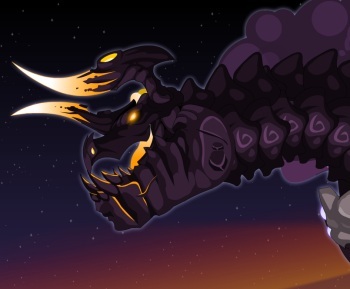 What to Expect This Week in AQW! Xan returns! Look for this hot-headed pyromancer to really heat things up for some poor, unsuspecting townspeople! Dage's shop will remain until next Monday! Limited Time Shop: Spring Theme! The next I Can Has Mod contest starts this week! J6 t-shirts are sold out but we ARE ordering more, so keep an eye on HeroMart's website! More details of this Friday's release will come throughout the week! And thanks to multiple players on Twitter (like Bladebrawl and 1023404), tomorrow's Design Notes will see a more in-depth look into what we do to make a week's release happen. There's a lot of little things you guys never see, and more Chaos involved than ever makes it in-game! Fire, Water, Wind and Earth… and Desoloth! War has come to Etherstorm and the DragonPlane! 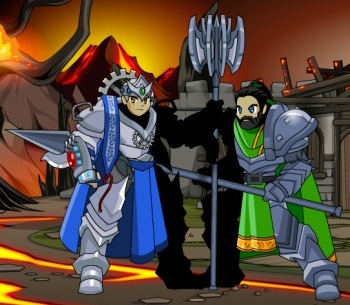 Choose a side; fight for Good, Evil or Desoloth in AQW’s first 3-sided war and battle to decide a whole realm’s destiny. The winning side will determine Desoloth’s fate… and affect the end of the Chaos storyline! The Cor Draconis is the heart of the DragonPlane. What did you do to make Omom so ANGRY?! The choice is yours, Hero! Will you fight for Good, Evil or Desoloth? 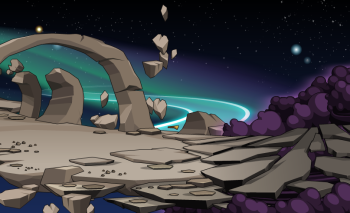 Only ONE side can win this war, and whichever one does will determine Desoloth’s fate… and will have an impact on the end of the Chaos storyline in the future! Dragons. Magic. What more could a fantasy-loving game player want? Loosely based on the class from AdventureQuest Classic, we’ve given the armor and skills an epic AQWorlds twist to keep things fresh and unique! Check out Thursday’s Design Notes post from Cysero to get an idea of the Dracomancer Class’s skills! 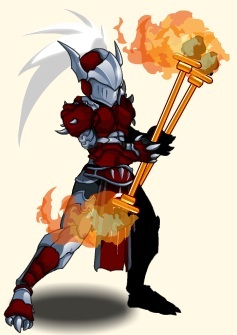 On Friday you’ll be able to purchase the class from Itzachi in Battleon for 2,000 ACs or from any of the Etherstorm Priests if you’ve achieved rank 10 in Etherstorm rep! And MEMBERS can now purchase the SkyGuard Grenadier Class for 2,000 ACs, as well! Talk to Itzachi in Battleon! One of the BEST things about wars is all the awesome rewards, and the Etherstorm battle won’t be any different! We’ve got a host of excellent war merge rewards, and each sidewill have its own gear to earn! But don’t worry, if you like the look of another side’s rewards, YOU can earn them, too. You’ll just have to battle that side’s monsters to earn the required merge items! Copper Rainment of the Black Dragon! Silver Rainment of the Black Dragon! Gold Rainment of the Black Dragon! Happy birthday Dage and Solrac! Both Solrac and Dage the Evil had birthdays this week! 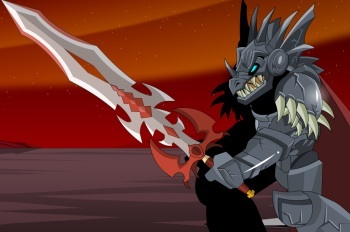 To celebrate, Dage has released a special Evil Deathday shop in Battleon! You’ll be able to get the following gear, whether or not you’re a member of the Legion. 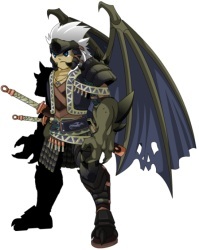 But if you HAVE gone over to the Dark side, then you’ll be able to purchase the extremely rare Paragon pet for 2,000 AdventureCoins! Must complete Legion quests to purchase! The positively Evil Paragon Pet! Thanks for this absolutely ACE shop go to Herzer Herring, the latest winner of the I Can Has Mod contest! She selflessly wished for a shop to celebrate her home country. That means blokes and shielas everywhere can get these non-member, spiffy prezzies for gold by talking to Mick Dundoo in BattleOn! Mick Dundoo Armor and hat! Will you fight for Good, Evil, or... Desoloth? Kill Desoloth... or kill dragons FOR Desoloth! Drunk with power and the anarchy he has caused, Desoloth the Final is finished waiting. The time has come to make his move on Etherstorm, but the battlefield is far from where you've been fighting! This portal transports you between Lore and the DragonPlane. Fire, Water, Air and Earth all join together in the DragonPlane, and at their center - the Cor Draconis. The heart of the Plane and the heart of elemental dragons, it is imbued with eons of draconic power. And it's the only place secure enough to hold Desoloth now that he is this powerful! Do not be distracted by the beauty; death is present in every stone. But his downfall and imprisonment in the Cor Draconis is far from a sure thing. Those who choose Evil may feel that his attacks merit more punishment than just imprisonment. And for those who choose to fight on Desoloth's side... his freedom and rise to power is the only goal. Paths to the boss battle frame and the Cor Draconis will only unlock at 100%! But how easy accomplishing that goal will be when Drakath has turned his attention to Etherstorm's anarchy remains to be seen! The choice is yours. War comes to Etherstorm THIS Friday! 3 sides to choose from! Fight for Good, Evil, or Desoloth! Battle Chaorrupted Elemental Thunderbirds OR Elemental dragons! Winning side will affect the final battle against Chaos! 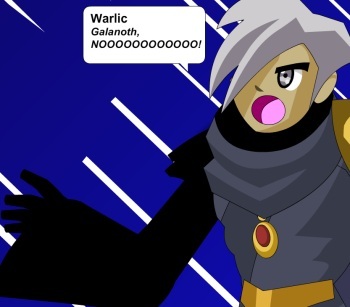 Unlock a cutscene starring Galanoth at 50% on the war meter! Members will receive double resource drops from the member-only merge quests! * All 3 endings are written, but YOU will pick which one we animate and which becomes storyline canon based on the war's victor! Dracomancer Class coming THIS FRIDAY! Cysero and Yorumi are hard at work designing and coding the Dracomancer class. 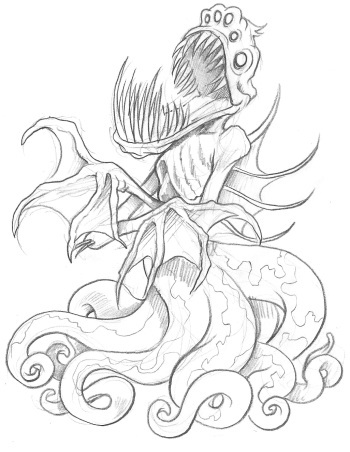 Dage just came in with a concept sketch and it is pretty awesome! Cysero's Dracomancer skills writeup will come later this week! 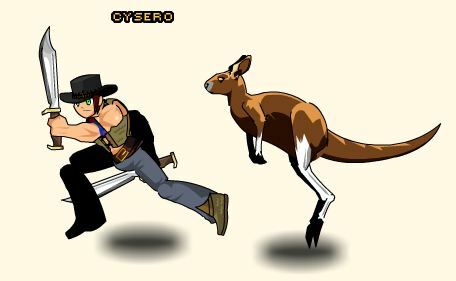 Sadly, Cysero's been swamped pitching in on this week's release (are you ready for the Aussie Day Wish gifts? I know I am! Aussie Aussie Aussie! OI OI OI! /cheer) so there will not be a member-only midweek release this week. And next week he will be writing the next installment of the Xan storyline. Members, look for a return of the midweek releases on March 14th! Where have all the Pancakes Gone? How to feed my pet dragon? Where is the sweetest ending? Thousands of pancakes have been consumed, and even more heroes were injured by falling flapjacks. Pancake Day is gone for another year! Tuck into any plates you've hidden around Yulgar's Inn and dream of the next syrup-laden day to come. * It's Late-90s Music Day! Ah, memories. Jump for joy, because tomorrow is Leap Day! It only comes every four years, so to spring into action, we're offering four boosts to bump up your battling! Look for four FREE boosts in Battleon sometime tomorow - EXP, gold, rep, and class rank boosts! Celebrate, celebrate, /dance to the music!Wish Solrac a happy birthday on Twitter or the forum as he furiously Flashes awesome art for this Friday's war rewards! /Cheer him on as he levels up in real life! The Return of Xan NEXT Friday! Things are about to get HOT! Next Friday will see the return of Xan, drawing to him flames and fury as he seeks out the target of his newest goal. Nearby locals have something he needs, something he MUST have! Without it, could his fire be forever extinguished? Find out next Friday! The King Fisher Character Page Badge is now up on your character pages. Of course, you must be a King Fisher with maxed out Fishing Rep to obtain this permanent pendant professing your piscatorial prowess. The Members who have Rank 10 Skyguard Reputation (and a few who weren't rank 10, actually) got to preview the Member Only Grenadier Class this weekend. The overall impressions were that it's a lot of fun and an interesting class build but they had problems with mana regen and felt that it was a touch under-powered, especially considering that it was the first Member Only class is a long time. Decreasing the mana cost for Flashbang, Sleeping Gas and Reactive Grenade by 5 mana each. Flashbang's base debuff will be changed to CRIT reduction instead of HIT reduction. Rank 4 Passive Adrenaline Rush will be changed to 8% Damage Reduction instead of 10% Dodge. In testing Stratos was able to solo Ledgemayne and I was able to solo both Ledgermayne and Wolfwing with the fully ranked class so this class is no slouch already if you know how to use it and how to manage your mana, but this should make it REALLY nice. By the time you read this the changes will already be in effect. Don't forget that Itzachi, the class dealer in Battleon, will be selling this Member Only class for 2000 ACs starting this Friday if you would rather take the shortcut rather than ranking all the way to 10. Every 4 years the calendar racks up a full day of time that was left over from all the other days. The solution to this problem is adding a day every 4th year. This is why we have a February 29th this Wednesday and Feb is normally a 28 day month. We've decided that we want to help you leap forward too. Starting some time on Wednesday, Feb 29th, we will be adding a Leap Day NPC to Battleon who will give you 4 simple quests. Each quest will reward you with a one-time free hour long BOOST for your XP, GOLD, REPUTATION or CLASS RANK. You will have 24 hours from the time that we release this to get the Leap Day Boosts and then they will be gone. Plan ahead and remember that this only happens once every 4 years! I CAN HAS AUSTRALIA DAY?! This weekend I got to hang out with the winner of this round of the I CAN HAS MOD contest, HERZER HERRING! She is from Australia and her wish is that we add an Australia Day NPC to the game who would sell Australian Themed Items! As per her wish, Mick "Crocodile" Dundoo will be coming to Battleon this Friday selling a number of AUS themed items and house items which were almost entirely suggest by Herzer Herring. As for the Golden Cheezburger, this one will work a little differently. She wished that it be changed into an rare Australian Themed HOUSE, based on the iconic Sydney Opera House! In order to get your house you will need to talk to Mick Dundoo and trade the Cheezburer in for the house. You MUST have a Golden Cheezburger Deluxe to get this rare house and once Mick Dundoo leaves, you will never be able to get the house again! There will also be other items like dual Bowie Knives (that's not two knives, mate... THIS is two knives! ), a Rugby Uniform Armor in AUS Olympic colors of Green and Gold, A green and gold "Boomer"ang weapon, A Cricket Bat with the AUS flag on it, Kangaroo and Barry the Platypus pets and some cool house items like an AUS flag for your wall and A Croc skin rug! ALL OF THE ITEMS IN THE SHOPS WILL BE FOR EVERYONE! NON-MEMBERS and MEMBERS! I mentioned the rare house over Twitter this weekend and it was met with an amazing amount of complaining. I was really surprised and a little hurt to see so many people griping about getting a completely free house based on the wish of a fellow player who did not want any recognition for herself (she didn't even want to be the NPC when I offered) but only a little recognition for the country she loves and calls her home. Thanks to everyone who saw this gift for what it is and accepted it with an excited smile. After brainstorming item ideas for the shop we farmed Skyguard for a while and I showed her some of the cool mod powers she could use while she was a mod, like going to secret mod only maps and even going back in time to closed events (While we were time traveling I let her pick up Alpha Pirate for herself as well as some other rares from past areas). She is a heck of a player, a loyal AQW Member & Supporter and a lot of fun to hang out with. Herzer Herring, it was a true pleasure getting to hang out with you. Thanks! We will probably only do ONE MORE ROUND of I CAN HAS MOD and we will let you know as soon as that starts! Etherstorm Goes Out With A Bang! The Eterstorm Saga is closing starting with this weekend's war. The outcome of the entire area will be decided by the outcome of the war. You will be able to fight on the side of Good, Evil or even Desoloth. 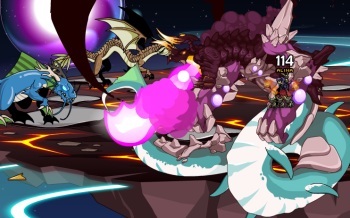 This weekend we will ALSO be releasing the Elemental Dracomaner Class for Etherstorm Rank 10. There will be an AC version in Itzachi as well but after this class we will probably start doing what we did with Grenadier and letting the Rank 10 people have it a week before anyone else so they can get a head start on mastering the class. We will be posting a skill breakdown and some images of the class later on this week. Dage The Evil's Deathday Party! Dage's birthday is March 2nd! There was a typo (not mine) in the 2012 AE calendar that said March 22'nd but it's actually this Friday! He has decided to craft some custom items for his birthday! Here is a full list of the birthday items. They are ALL ACs, and he priced them a little higher than average but hey, he's evil, whatcha gonna do? The pet is NON-MEMBER and it is also NOT a Battle Pet but does grant the person who owns the pet access to special quests and special additional Dage Rewards. In the heart of the Fire Realm, Ssikari - newly-raised Prime Fire Dragon - arches her head and roars. She and the rest of the Primes sense war on the wind. Flames climb into the sky and viscious winds whip them into a frenzy. Acidic rain pounds upon a battered, scorched Earth littered with shards of their vital, secret-containing crystal. The High Priests of Etherstorm gather deep belowground, safe - mostly - from the ravages of the Fire, Water, and Earth raging aboveground. Even here, in the heart of the Temple, Air bites their skin and lashes at their clothing. 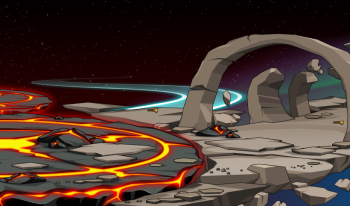 Nowhere... not a single realm, temple, or cave - in Etherstorm is safe from Desoloth's fury. I hear in the hissing of the flames that our time grows short. We have but a few weeks to prepare. They tell me that Desoloth plans to ravage Etherstorm, but we knew that. He will char us, scorch us into ashes. Drown the ashes until our corpses are mud, then bake the mud into hardened clay. And once we have returned to the Earth he controls, he'll pulverize it, scattering the grains of our future, ourselves, and our world on the wind. Summon the Hero! We must rally for war! The testing time has come - for the Hero, for our Primes, for us all! An earth-shaking roar splits the ground, assaulting the air in all four Etherstorm realms. The dragons tremble and the elements are whipped into an even more frenetic frenzy. Desoloth calls, and the elements answer. 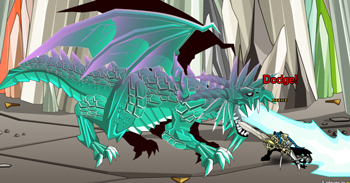 They turn on the dragons nearest them and attack, trying to consume the heartsblood of loyal dragons that Desoloth craves. If they do not stand with him, they will not LIVE and their blood will BURN! Time is short, so short. Be ready, Hero, because the fates of the dragons, of Etherstorm and of Lore are in your hands and heart! On Friday, March 2nd, WAR comes to Etherstorm! Will YOU be ready?! Go Fish! ... No, really. Bring your poles! 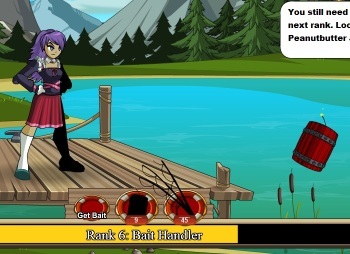 That's right, we're introducing tradeskills into AQWorlds this year, and we're starting with Fishing! It's not a minigame... kind of. 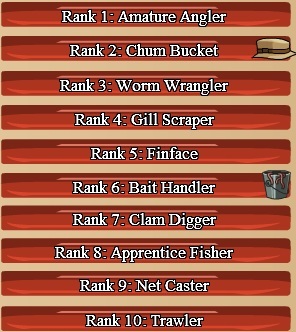 You'll be able to actually fish, but you'll be able to rank up 30 levels of your Fishing skill (and eventually skills like Blacksmithing, Potionmaking, scroll-scribing, etc), and receive different gear and items to earn at each of the ranks! You'll also buy fishy-looking gear that will enhance your abilities! Members will gain access to extras like the Super-pole! (Catch 3x the fish in one cast!) And speaking of FISH... there's a whole school of different, tasty fishies to catch and cook up (once Cooking is introduced, that is)! There's also the possibility of the fish you catch being able to increase your HP, STR, or other stats at some point in the future! Just wait until you catch the Jumbo Shrimp! Look for this deliciously exciting release to be introduced February 17! Dumoose has been the angler-wrangler for this project and says that testing is going swimmingly! We've got ideas in mind for other tradeskills to introduce as the year goes on, each with their own member and AC bonuses, but what would YOU like to see? Let us know on Twitter and the forums! This is the start of a whole new type of AQW gameplay, and we're looking forward to building the different skills up with you all to be as awesome as possible! Earth Realm- get ready, rock-steady! Rocks rumble and crystal shatters; the earth is unsteady and it's up to YOU to get Etherstorm's defenses in order before the world begins to break apart! Head inside the mystical, magical crystal realm which houses the Earth Realm's secrets! Battle crystallized elements as the earth fights back, but be careful... things could get rocky! 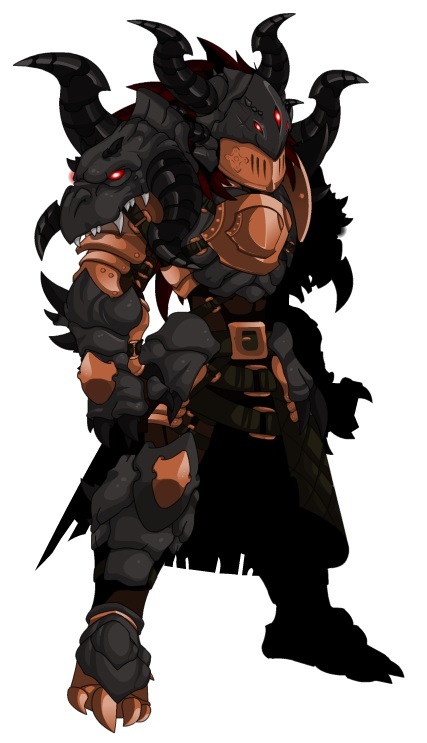 Desoloth is getting ready to launch an all-out attack and if your plans are not in place before he does, the elemental war he's planning will tear Draconic society - and all of Lore - apart! Lets not have any quibbling over this announcement, because the items Quibble Coinbiter - our favorite time-traveling salesmoglin - will bring are going to be fundamentally, elementally EPIC! Look for more previews of them as the week goes on! 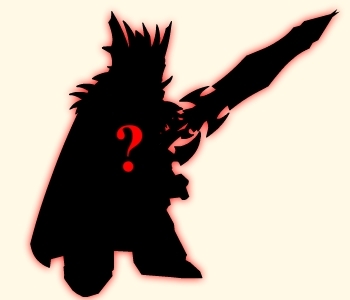 You'll find him in Battleon, shop open and shelves stocked, this Friday! HEY MEMBERS! Are you ready for another mid-week member-only release? You are? GREAT! Because we've got one in the works for you, and it'll take place in the much-beloved, long-ago released Cornelis map in Chiral Valley! Things are going to get pretty twisted, and the residents there need YOUR help to straighten their lives out! 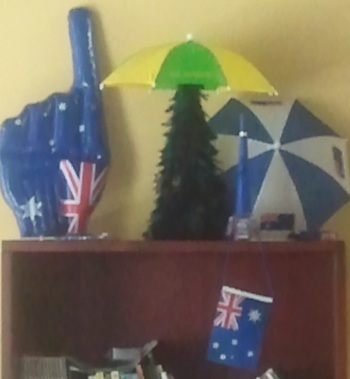 Thanks so much to Captain Sephira for the extra-special Aussie swag she sent to help us celebrate Augstralia Day! It arrived this morning and Cysero and I paraded through the halls of the Lab showing off all the sweet gear from a different hemisphere! Beleen models our Aus-some gifts! But the Australia cape (which looks great with my shirt today, coincidentally!) and flags were not all! We've received pins, a GIANT FOAM FINGER, and the wicked umbrella hats you see in the picture below! Beleen also trumpeted her excitement at the swag to the whole team when she blew on the Extra-Special Aussie NoiseMaker (tm)! The foam finger points away from Australia. Once again, thanks to Captain Sephira for the epic gear and rockin' letter! Happy belated Australia Day, everyone! Where Galanoth's Future is Decided! Oh, and keep an eye out for anything fishy on the beach. Something that prooooobably shouldn't be there. Once you find it, run away. Fast. Dage, Solrac and Jemini have whipped up some wildly awesome Suggestion Shop items based on the work of Impactor, Ayuzu, and disturbed indestructible! Fantasy Warrior and Disturbed Blade! Fantasy Warrior and Valkyrie Blade! Hey MEMBERS! Make sure you /join tower to check out the newest mid-week member-only release! Learn about the shadowy Silent Sentinels, an organization within the Guardian Order itself! Member-only Mid-week release in Cornelis! 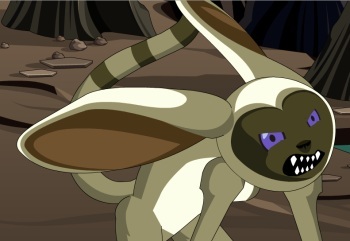 Quibble arrives in Battleon with an Etherstorm-themed shop! New weapons in Chinese New Year shop! Of COURSE they're guarded by a DeepDweller! Etherstorm's Water Realm is comprised of marshy areas spilling into the ocean! When the unthinkable happens, lives will be changed, but you'll have to wait for this Friday to find out whether it's for the better... or worse! Alina: Hey, Artix? We're REALLY going to do this. Just like we said we would. Fair warning. Galanoth: They'll NEVER see it coming! Just make sure the DRAGON is there! * We know it's "whet your appetite." It's a pun. We make those a lot. In the Guardian Tower, who watches the watchers? You don't know much about the internal workings of the Guardians in BattleOn's Guardian Tower, but this Wednesday, members are about to get a MUCH closer look at what goes on behind locked doors and inside fortified towers! Seems like they're up for watching YOU, if not a secretive Guardian organization! Get ready to go on the inside of one of the most powerful - and secretive - groups that control the Guardian organization from behind the scenes. Are YOU up to the challenge of helping them? You'll have to be a member to find out! Beleen is SUPER-excited and wants to make sure you know that you can get a PINK version of the Chinese New Year dragon armor in her secret shop (where, oh where, could Beleen be? Gee, I don't know! But I bet somewhere in this Design Notes there's a hint!) AND in the Chinese New Year merge shop! The Chinese New Year non-member helm no longer requires a member helm. The inability to /join castle on the Alina server is being looked into. The Living Air monster's disappearing/re-appearing head issue has been fixed. Have a great Monday night and an awesome rest of the week! We'll see you Friday for the most INTENSE battle cutscene we've ever produced! Seriously. Be on your guard in the Air Realm! Lightning flashes when Air and Earth clash! Winds of fire scour the sandy land. Noxious fog settles in the valleys, choking the breath from the dragons that remain. All this, As'iiur sees. And he despairs. That is why he need YOU, and with you, Galanoth, to help him create the dragon-strength air-binding potion to subdue Desoloth. Wind be ever all around you, Hero! Only then will his realm - and his precious draconic children - be safe! Galanoth's knowledge of how potent to make the air potion will come in handy while you are off battling to gather the components. But beware, for all is not as it seems! Can you trust those around you? Also be sure to check out the additions of two of our newest contributors! Hizu, formerly a HeroSmash animator, is going to begin helping Samba animate monsters, freeing her up to pump more epicosity into the cutscenes! And welcome Reeky to the AE team! He is Warlic's sound assistant and composed the gorgeous music you're hearing tonight! Welcome to you both, the AQW team is lucky to have you! Panlong, the legendary lake dragon, has risen to welcome in the new year as the old one flows out with the tide! He has many quests for you to go on, Hero, and even MORE rewards for you to claim once you're done! Year of the Dragons on parade! FOUR colors of the Dragon Armor! The Chinese New Year's event will be available until Monday, February 6th! If you didn't log in on Wednesday, Members, you've got a WHOLE member-expansion storyline to do! If you like shadows, assassins, or saving princesses, then this is the update for you! Take a tour of a new addition to the Akiba map and get some EPICLY shaded shadowninja rewards! We cut the Cheese release! That's right. It was us. We'll take the blame. No new Cheese Day items. Try not to be bleu. It stinks, I know, but we just didn't have time while producing all this other AWESOME content! So no new Cheese items, and all those great, gooey rewards from last year are still rare. Don't worry, though, the rest of the release is full of muensters to battle and some really gouda-looking rewards to gain! Sorry, that last line was probably too cheesy. Next week as we journey through Etherstorm's Water Realm, we'll find out just where Galanoth went, and more importantly... WHY. After that, we'll start rockin' with Etherstorm Waste's Earth Realm. Beyond that comes... Valentine's Day! But beware, because ARTIX is writing this holiday event, and he WON'T let me even look at the script. Mermaids, love, and... Artix writing it all?! Have a GREAT weekend, everyone! We'll return on Monday for another week of stories, gaming, and unpredictably Chaotic insanity! 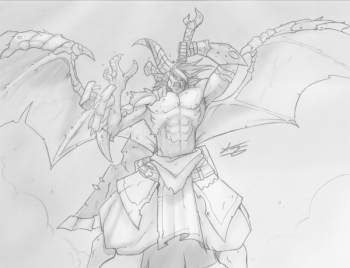 And speaking of unpredictable insanity... have you seen Artix's new AQ3D project Design Notes? FIRE in the hole*! Flaming unicorns, exploding volcanos, fire elementals, fire spirits... this is going to be one HOT Friday the 13th! Forget sunscreen -when a GIANT MECHANICAL ROBOT** attacks a town on the other side of Mount Etherstorm***, you're going to want an asbestos suit to protect you from the heat! And it just wouldn't be Friday the 13th without one of AQWorlds' favorite musical guests and his sidekick, Voltaire and Deady! Voltaire's idea on how to deal with this mechanized menace - not to mention his flaming top-hat - are really going to get you fired up this weekend! And did I mention the UNICORN****? I did? Good. Trot it like it's hot. We'll be introducing a host of new NPCs, including King (so royal he does not permit his subjects to use his name) and Lieutenant (who wishes to mock King Aldebaran so much he goes only by his rank). Pictured: NPC too cool for names. They'll be integral parts in understanding just what made this missile-shooting mecha miss go mad! If you can't stop her, not only the town below Mount Etherstorm will be threatened! 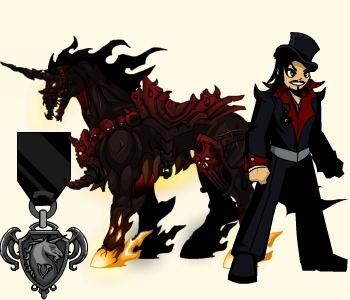 With some epicly steam(punk)y rewards in the AC Event Rares shop and as drops, including the Flaming Voltaire Top-hat and the Baby Flaming Black Unicorn pet, this is one event you won't want to miss! And be sure to turn the music UP, UP, UP because 3 of Voltaire's most incredible songs - including "Riding a Black Unicorn Down the Side of an Erupting Volcano While Drinking from a Chalice Filled with the Laughter of Small Children" - will rock you through this release! * Also, the whole zone! ** Yes, mechanical robot. Stressing the "mechanical" nature. Today's robots are full of computer chips and almost-magical techno-wizardry.This one is not. *** While this event will take part on the other side of Mount Etherstorm, it will not be a part of the Etherstorm/Desoloth storyline. **** NOT talking about the fluffy pink variety, either. No sir. You may have read this already in Cysero's Design Notes yesterday, but Vader Darkside won round 2 of I CAN HAS MOD and wished for a non-member farming class. We're calling it the Darkside class! Cysero promised you guys that he would post pics as soon as he had some and here they are. As Vader Darkside wished, this class will focus on attacking many enemies at once to help people who like to grind and farm for rep or special farming rewards in the Dage and Nulgath areas. Here is a closer look at the armor. Dage also made a really nice helm for the armor but Cysero's Golden Cheezburger is only one item so it can only turn into one item, and that is the class. 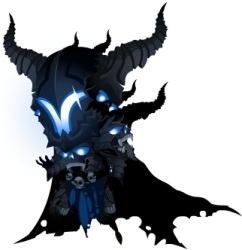 Dage is considering adding the hood to his own Legion Shop later. Vader Darkside also wished that the class be a PET class. All pet classes have the ability to summon their own custom Battle Pet or Members can equip other battle Pets that they can buy around the game. The Darkside class will be able to summon the Hate Wolf. This Arcane canine is not only the Darkside's constant companion, it is also the focus for his or her magic, allowing their rage and malice to flow through their pet to achieve maximum magical devestation. A few appear to be confused on some of the finer points of the class so we'll clear them up now. Vader Darkside wished for Cysero's Golden Cheezburger to turn into a pet based class that anyone can use. When he said "anyone can use" he meant a non-member class. He did not mean that anyone would be able to obtain the class. That's why he specifically wished that the Cheezburger turn into the class. A lot of people are saying that they "lost" the Golden Cheezburger item. We've checked many of the accounts claiming this and found that none of them ever had it in our records. Some of you might have deleted it accidentally, some of you may have forgotten that you deleted it, and some of you are trying to acquire the class unethically. We're sorry if this actually did happen to you (anything is possible) but no Golden Cheezburgers will be given out. The class will also not be sold for ACs. This was all part of the contest wish and the item itself even tells you to hang onto it. If you missed out this time, hopefully you won't next time. As Cysero mentioned, we will TRY to get the class out by Friday. This timeframe is not a promise but we DO promise to try our best to get it out BY FRIDAY. Once the class has been tested and balanced so that no further changes need to be made we will post a skills breakdown here on the Design Notes like we would with any other class. Congrats again to Vader Darkside, and well done on this very selfless wish! The ICHM (I CAN HAS MOD) contest will begin sometime after the Darkside Class has been released and the next Golden Cheezburger will once again be availible from Cleric Joy's shop in Battleon. Remember that Members and non-members can wish this contest but you can increase your chances by being a member or completing whatever AExtras are availible and offered in your region of the world.